Turbine and generator shafts are highly stressed components of the turbine-generator set. Due to the power generation industrys desire to decrease outage time and extend inspec-tion intervals for highly stressed turbine parts, advanced and reliable NDE methods were developed by SIEMENS NDE laboratory. Test methods which ensure mechanized in-situ testing without additional expenditure for disassembly of turbine parts are required, in particular, to fulfil the prerequisites for NDE services in power plants. This paper describes an inspection system which enables in-situ ultrasonic inspection of casing joint bolts during outages. The special design of the inspection equipment allows inspection of bolts under limited accessibility conditions. The application of the phased-array inspection technique for blade attachment grooves of LP turbine rotors is also described. This advanced technology enables inspection of the most critical areas of the blade mounting regions with the turbine rotor in the assembled condition. The liberalization of international electricity markets has brought increased competition among power generation companies, leading, in turn, to a greater need for efficient and effective power plant operation. Only effective operation coupled with a systematic maintenance and inspection concept guarantees continuous plant availability in the long term. Highly stressed components in a power plant include the rotating components of the turbine- generator set (i.e. the turbine and generator shafts), as well as boilers, steam piping, valves and casing joint bolts. Stresses are induced by temperatures, vibrations and pre-loads, as well as centrifugal forces on rotating components. Nondestructive examinations (NDEs) aimed at reliably detecting damage induced by service-induced stresses (for example cracks) are carried out on highly stressed components during scheduled plant outages. Fig 1: Steam turbine casing joint . Fig 2: Incipient crack in a casing joint bolt. Casing joint bolts are designed to hold together the top and bottom halves of the turbine casing and ensure absolute leaktightness. To enable this, the bolts are heated (using an induction or flame heating process) during assembly. The shrinkage that occurs during cooldown generates a preload in addition to the mechanically applied torque. 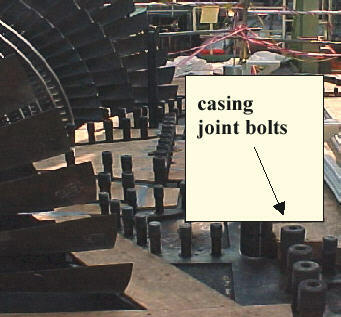 Figure 1 shows casing joint bolts of a steam turbine. Steam turbine casing joint bolts Incipient crack in a casing joint bolt The enormous stresses prevailing in the preloaded casing joint bolts create favorable conditions for incipient cracking in the first load-bearing thread turns. Such cracks can lead to loss of leaktightness, leakage and possibly deterioration of turbine-generator performance. For this reason, nondestructive examination of casing joint bolts is recommended during steam turbine overhauls (1). In the past, casing joint bolts were always removed for crack inspection (MP examination) of the highly stressed area. Conventional ultrasonic examination in the in-situ condition (from the top of the bolts) is not possible due to the heating bore. The use of digital ultrasound technology in conjunction with state-of-the-art manipulation technology enabled development of an inspection system to meet the above requirements. The system consists of a dual-axis manipulator which guides the ultrasonic search unit via a flexible shaft. Data transmission is via a sliding-contact connection with a digital ultrasonic device. Since bolts that that can only be accessed via an assembly opening also have to be examined, the inspection system was equipped with a 2-meter long flexible shaft. Fig 3: System for ultrasonic examination of casing joint bolts. 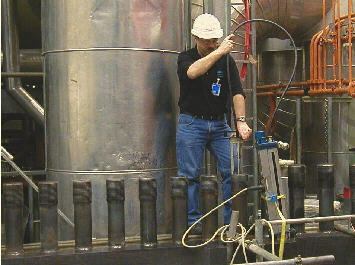 Fig 4: Mechanized ultrasonic examination of casing joint bolts of a highpressure turbine section in a nuclear power plant. The inspection system was deployed for the fist time during overhauls of high-pressure turbine sections in nuclear power plants in April 2001. Use of the system eliminated the need for removal and reinsertion of the casing joint bolts. The very first inspection revealed indication on an inner casing bolt. Following removal of the bolt in question, a crack was detected by means of MP examination. The advantages of the inspection system came into their own a few weeks later at a nuclear power plant in Germany. Internal casing joint bolts in a high-pressure turbine section which had not previously been accessible using conventional inspection techniques had to be examined during a very short outage. This inspection was particularly important, since a loss of leaktightness in the vicinity of the casing joint was potentially due to incipient cracking in casing joint bolts. The bolts are sited inside the turbine casing, and could only be accessed via an assembly opening approximately 1.5 m above their location. Controlled cooldown of the turbine casing and the casing joint bolts enabled ultrasonic examination of the internal casing joint bolts to be carried out only a short time after turbine shutdown. Use of the flexible shaft enabled inspection of the bolts in just a few minutes despite the difficulty of access. The inspection results (no indications) enabled the cause of the loss of leaktightness to be rapidly identified and eliminated. The use of the mobile ultrasonic examination system for casing joint bolts thus delivered rapid, reliable and accurate inspection results, which in this case had a direct benefit for the customer in terms of preventing outage overrun. 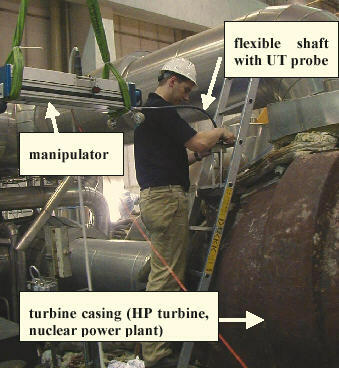 Fig 5: Mechanized ultrasonic examination of internal casing joint bolts in an HP turbine section at a nuclear power plant. Turbine shafts are among the highly stressed components of the turbine-generator. Certain areas of turbine shafts are exposed to especially high stresses, depending on the design, material properties and special service conditions. In steam turbines, such areas include in particular the blade attachment grooves of LP turbine shafts, which are mainly exposed to centrifugal forces induced by a speed of 3000 1 /min and the dead weight of the blade. Depending on different influences (such as steam quality and the number of turbine starts/shutdowns), this stress can lead to crack formation in the blade attachment grooves. If such cracks in the blade attachment areas are not promptly detected, this can lead to serious accidents with far-reaching consequences. The areas concerned are therefore subjected to nondestructive examination during turbine overhauls. In December 2001, Siemens Power Generations NDE laboratory received a request to perform a nondestructive examination on blade attachment grooves of a non-OEM turbine. The problem is discussed in greater detail below. There are several designs of blade attachment grooves of LP turbine shafts. The grooves can run either circumferentially (in which case the blades are inserted in sequence and secured with a locking blade) or axially. In the case in question, the blade attachment grooves ran circumferentially. It was known from experience of turbines of identical design at other operators plants that the grooves of 3 blade rows were particularly susceptible to crack formation. An advanced ultrasonic examination technique had to be developed to provide reliable data on the condition of blade attachment grooves without deblading the rotor. 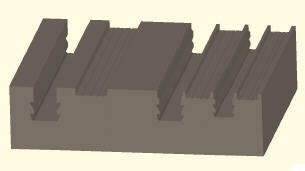 Fig 6: Blade attachment grooves of an LP turbine shaft. 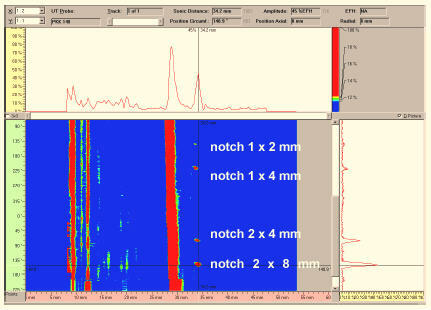 Following analysis of the problem, it was decided to solve it by means of the ultrasonic phased-array technique. Given the different dimensions of the blade grooves to be inspected, different scanning positions and angles of incidence are required to examine the highly stressed areas for cracks. 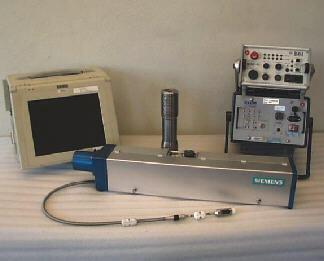 This meant that the advantages of the phased-array ultrasonic examination technique could be fully leveraged. The requirement to ensure that all relevant areas of the blade grooves are scanned, and that small cracks are also reliably detected, necessitated qualification of the inspection technique using an identical test piece. Figure 6 shows, by way of example, the profile of the blade attachment grooves. A separate test piece was fabricated for each blade row. Each test piece reproduces the geometry of the blade groove together with the outside profile of the turbine shaft. 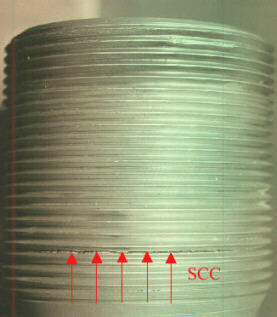 To ensure that incipient cracks exhibiting different orientations were also detected, test flaws in the form of grooves with a semi-elliptical profile were introduced at different angles in the most highly stressed areas (inspection zones 1 and 2 in Figure 7). To ensure detection of even the smallest incipient cracks, the dimensions of the semi-elliptical grooves used were as follows (length in mm x depth in mm): 2 x 1, 4 x 1, 4 x 2, 8 x 2. 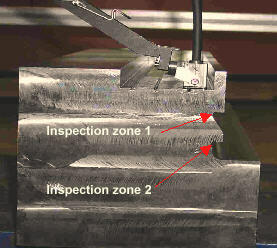 The grooves were positioned in inspection zones 1 and 2. Following fabrication of the test pieces, qualification of the technique was carried out using a 45 EL3 phased-array search unit (natural angle of incidence: 46°, search unit frequency 3 MHz, 16 array elements). The tests were carried out using a triple-axis manipulator in conjunction with the SAPHIR+ phased-array system. Fig 7: Qualification of Inspection Technique using Test Pieces. Due to the complex geometry of the blade grooves and the associated geometric indications, the search unit was moved in a vertical pan of ą 70° from the natural angle of incidence (46°) in 1° steps. Assessment of the TD images of all scans enabled the optimum angle of incidence to be rapidly determined. Figure 8 shows, by way of example, the TD image of a scan in inspection zone 1. By scanning the test pieces it was possible to demonstrate that the deployed phased-array ultrasonic inspection technique is suitable for use in field service to examine blade grooves of LP turbine shafts for incipient cracking in highly stressed areas in the assembled condition (in other words without removing the blades). All of the test flaws in inspection zone 1 and 2 of all three test pieces were detected (the smallest test flaw was a semi-elliptical groove 2mm x 1mm). Qualification of the inspection technique using test pieces configured to reproduce real dimensions will enable its first deployment on a turbine in the coming year. These two examples of advanced inspection techniques demonstrate that direct customer benefits can be delivered through the use of problem-focused techniques. Key examples include time savings on component disassembly and reassembly, required with conventional crack inspection techniques, but eliminated when advanced techniques are used. Given the requirement for virtually non-stop power plant availability and the associated reduction in plant downtimes, these kinds of in-situ service techniques are playing an increasingly important role in the planning and performance of plant outages.